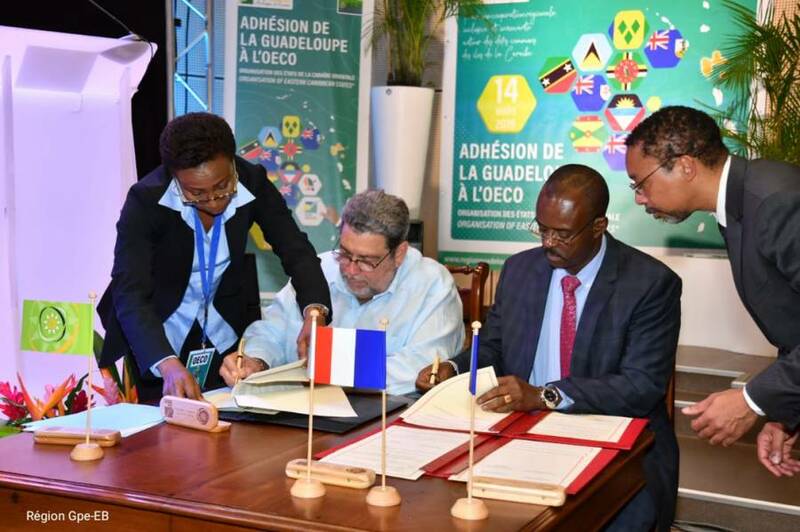 The Caribbean island of Guadeloupe – an overseas Department of France, has formally joined the Organisation of Eastern Caribbean States (OECS) – a regional grouping comprising the independent and non independent countries of Antigua and Barbuda, Commonwealth of Dominica, Grenada, Montserrat, St. Kitts and Nevis, Saint Lucia, St Vincent and The Grenadines, British Virgin Islands, Anguilla and Martinique. The Ceremony officiating Guadeloupe as an Associate Member of the Organisation took place in Basse-Terre, Guadeloupe on Thursday, 14 March at 5 pm at the University des Antilles, Basse-Terre.OECS Chairman and Prime Minister of Saint Vincent and the Grenadines Dr The Hon Ralph Gonsalves said the accession of the French Territory was a momentous occasion in the life of the OECS and in furtherance of the deepening and broadening of the regional integration of small Eastern Caribbean islands. “Our geographical propinquity, shared history of European colonialism, and the reality of our Caribbeanness — the essence of our Caribbean civilization — all pre-dispose us to a closer union in the interest of our people’s humanisation” said Prime Minister Gonsalves. “The enlargement of the OECS, with the accession of Guadeloupe to associate membership, opens up tremendous possibilities not merely to survive but to thrive more markedly across the arenas of economy, society, culture, and polity. “While centuries of European colonial rivalries in the Caribbean have contributed to the fracturing of our countries in differing linguistic groups and a contrived island separateness, it is these contradictions, and separations which are the very seeds which pre-dispose our territories to a greater and more perfect union” said Prime Minister Gonsalves. The Chairman in extending a warm embrace to Guadeloupe as an Associate Member noted the accession of the French Territory added tremendously to not only the land and sea space but to the economic potential of the regional grouping. “Our shared contemporary reality, the memory of the pains and joys of our historic journeys, and the imagination to capture a spirit devoid of learned helplessness were now grounded in a confidence that better years lay ahead for the regional grouping, together”. President of the Territorial Council of Guadeloupe Mr Ary Chalus welcomed the distinguished Heads of Government and the OECS Director General Dr Didacus Jules. President Chalus said on behalf of all Guadeloupeans the Accession was a historic moment in the life of the Territory. “Our Caribbean region is a remarkable space, a cultural and natural wealth often praised, even envied, yet still underestimated, with an immense potential before it. “Our shared history, geography, physical and human ties are self-evident in institutionalizing corporation with our neighbours for the promise of a better future for our youth and the development of our people. President Chalus added that the expression of the new levels of collaboration that Guadeloupe as an Associate Member of the OECS could look forward to, included functional cooperation such as the INTERREG III program which was delivering solid development outcomes for the Eastern Caribbean. “The program contributes to the integration of the Caribbean space and responds to the aspiration of our populations and our Accession will seek to deepen this cooperation and outcomes. President Chalus added “with you, Territories and States of the Caribbean, we share a unity of destiny; island economies, territories vulnerable to climate change and facing the same challenges in terms of energy supply. “The triple Caribbean, French and European membership must be approached pragmatically because, like Martinique and Saint-Martin, it offers Guadeloupe real opportunities for its development while nourishing the contribution it intends to make within the OECS. “Regional cooperation is not an accessory; we think it inseparable from political action and it’s even more natural that we share more than a geographical proximity. “Between the literary greats of Derek Walcott and Edouard Glissant, there is a unity of vision between our people and a shared culture that is our point of convergence connecting the genius of each of our territories and without which we would be mere dust in the wind. “Our people are united by nature; mutual aid has always been at the heart of our societies and it is in this sense that we must think and act. “Guadeloupe shares a strong community of interest with OECS Member States and we enthusiastically embrace our membership to the Organisation. “Divided we crumble, United we stand” concluded President Chalus.